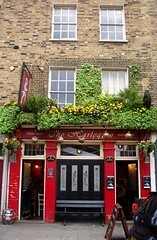 Pub behind Sadler's Wells Theatre, just south of Angel Station. Signs suggest they are open from 8am. It was very quiet on the Friday lunchtime of our visit, but the beer was decent enough; Black Sheep was £3.00, and they also had Landlord on. Free wireless is available but you need the WEP key. They have board games available. Toilets are small and at the back. The gents urinals have been boarded over. Monday night is Student night, with vodkas at £2 and mojitos at £3. Students can also get a bowl of chips for £1 before 5pm any day. Last visited by Bob and [Ash]?, 23 November 2007. Prices verified on that date. Opening hours taken from the 2008 Good Beer Guide. Last edited 2016-03-16 08:40:02 (version 10; diff). List all versions. Page last edited 2016-03-16 08:40:02 (version 10).